We haven’t played a proper game of NQM for ages, so we happily trooped off to Chris Kemp’s when he invited us over for the evening. An interesting circumstance meant Chris had set the table up in a position with limited access, so we played the tactical part of the game away from the table, making decisions and rolling dice between us … relaying the answers, numbers and results to Chris, who was updating the table and moving the figures. Periodically we got to go up to the table and see what had happened. A very interesting way to play the game. 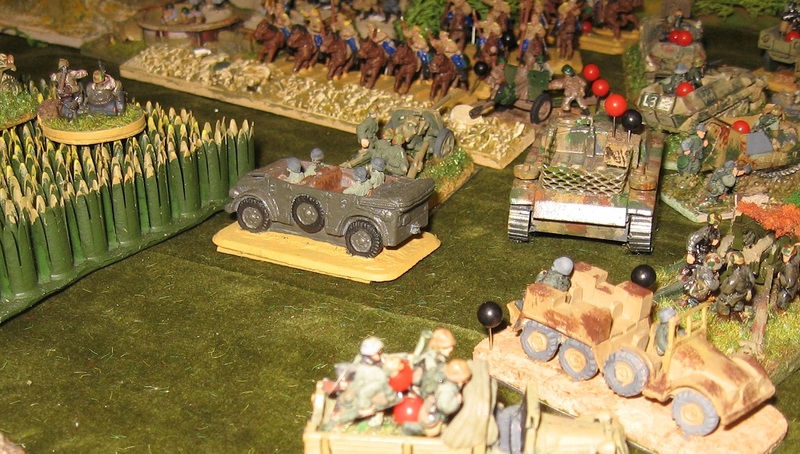 Marking a return to the long-running Barbarossa campaign, the scenario found us at Moscow in early 1942, following Germany’s successful taking of the city in a winter offensive. We started out with maps and plans, identifying where the new initiatives would focus and setting corps level objectives. 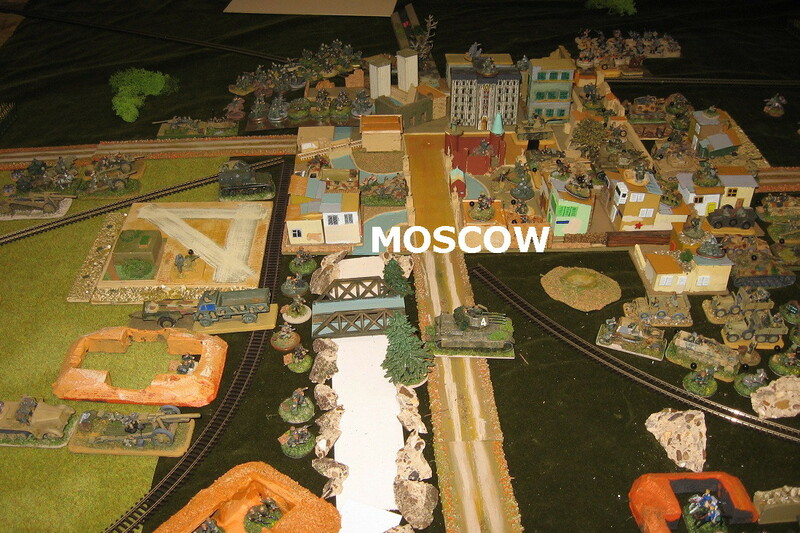 The table depicts Moscow and suburbs, with a variable amount of the open areas around the city. For the game, NQM has reverted to the earlier scale of a base representing a ‘one or two companies’ sized formation, but where each Brigade represents a division. Roughly. So the board is very tightly packed with troops. As a German player, and determined to keep the capital, I was nevertheless frustrated that the Soviet Union had not collapsed. We absolutely must keep up the pressure and find the vital brick to punch out that will cause the whole house to fall down. Our intelligence seemed to indicate the junction of two Soviet fronts just South East of Podolsk, and I want the bulk of my armour and mechanised forced to find and cut through that junction. However, there is clearly substantial Soviet armour massing to the north of the front line, and I need us not to be caught unprepared in this sector. The number of different unit designations of which I was becoming aware (coupled with the Umpire’s determinedly vague use of casual descriptions … ‘some tanks’ … ‘a division or so’ … ‘more than one formation’ .. etc. you know the sort of half-informative stuff) convinced me this would turn out to be a Tank Army, and a typically Russian ploy to scythe into the rear and cut off our forces in Moscow. So, in addition to the main offensive south of the city, I ordered some considerable ‘heavy probing’ in the north in the hoping of forcing the tank formations to show their hand. 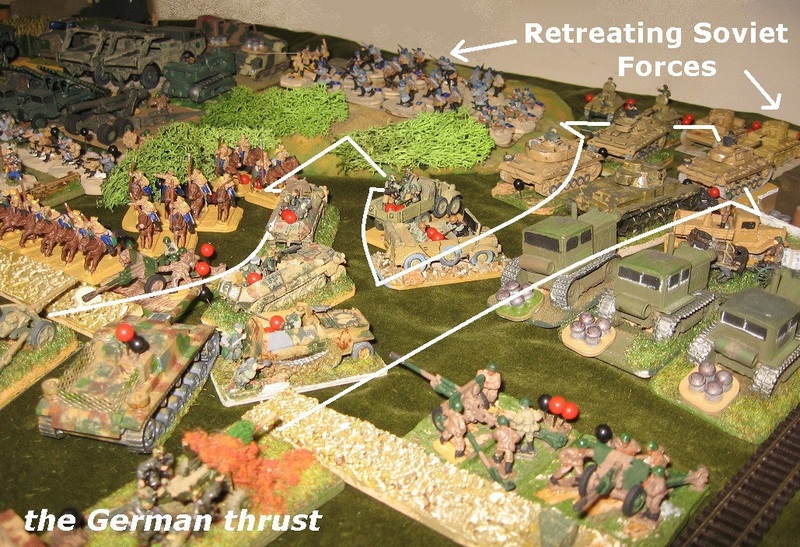 This job had to be done by infantry units – but stubborn ones, and lots of them..
'Manner gegen Panzer': dig in, roll high and pass your break test! This turned out to be a very important move as those Soviets formations fulfilled all my worst expectations. Fortunately the troops proved very effective at the unequal struggle (both in their rolling for hits on Table XII and their break tests and tank terror). The tankers, on the other hand, proved less disciplined and several of the victorious units drove on towards West Moscow leaving unbroken Germans and their own support formations behind. In time, I still think this sector will crumble, but much of the sting has been taken out of the counter offensive and a lot of time has been bought. Meanwhile, to the South East, things were going very well. 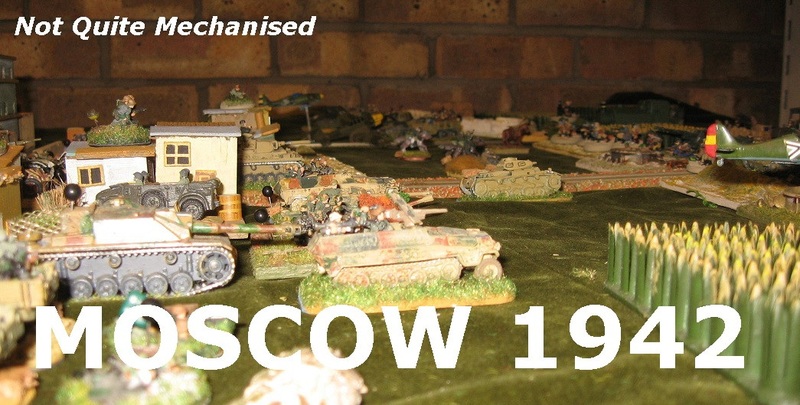 In a series of massed rolling assaults, lighter Soviet formations were pushed aside, and a sizable formation of obsolete armour was driven back … ‘Push on! Push on!’ were my orders as I hoped to keep the enemy on the back foot. Actually, I think this will work as the Russians are significantly disrupted, and there are reserve formations that can be fed into the deepening corridor. At the sharp end, the thrust is still doing significant damage and must surely turn decisive soon. The red pins are current (unreorganised) hits - the black are permanent ..
As those comments betray, with the action swinging favourably towards the Germans, we had to break off and wrap up the evening. Movement, I sure, was the traditional ‘whatever Chris thinks appropriate’*; recce followed the established ‘3 dice’ method (us/them/what range?). Firefights were still being resolved by Table XII (and its sliding H/M/L hits matrix), assaults with modified ‘risk’ dice. Hopefully the railheads and airfields will now flood with material and reinforcements. We have the enemy at out mercy. Hopefully we will have more to report from this operation. *NQM has always used a ‘variable length bound’ approach that moves the play on swiftly to the next significant action – however, one look at the table will show this theatre so crammed with formation that there was little scope for wide sweeping moves of dozens of kilometers at a time. It was nice to see NQM is still going strong and producing such interesting games. I always enjoyed playing NQM, but without Chris Kemp I never felt that the game was a good; he was the essential ‘missing ingredient’ that a good game required. I hope to read further battle reports in future. Like Bob I too have fond memories of playing NQM in the 1990s. Unlike Bob I also ran several – albeit not neccessarily as CK would have done! 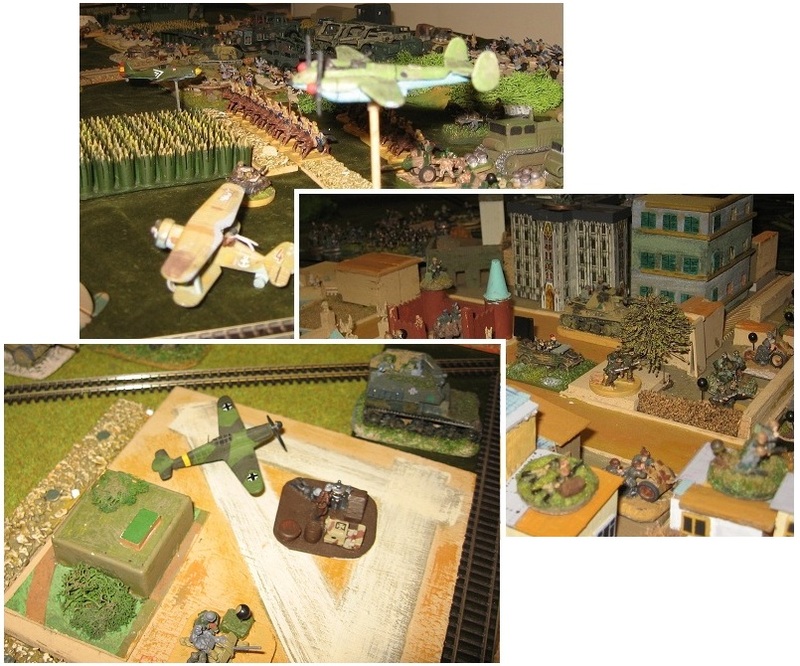 Despite your game using 15mm toys (they’ll never catch on…) it looks very similar to the photos I have of the Kursk game Chris ran in 1995. Good stuff. Great looking game, very glad to see NQM is still going strong! Thanks for an excellent post Phil, and the kind words everyone. Looking back at the War Diary, things have been quiet for a bit haven’t they? 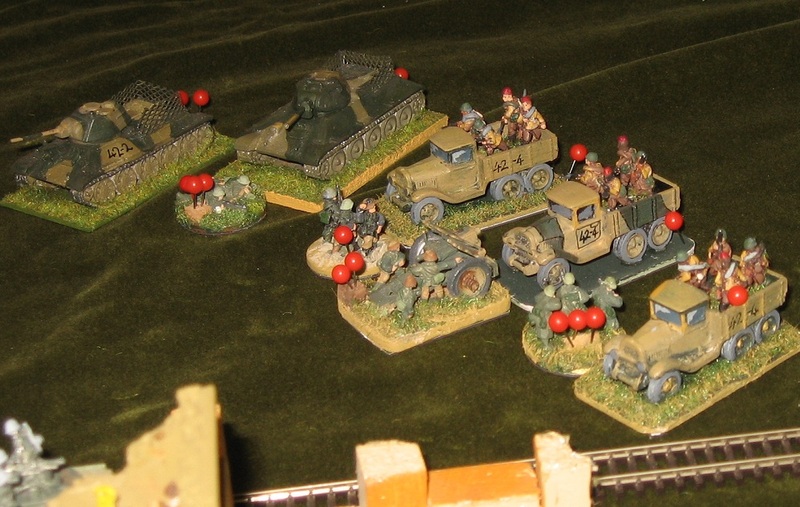 … and yes, it looks as if this version of history is seeing Stalingrad being fought at Moscow in a car park. 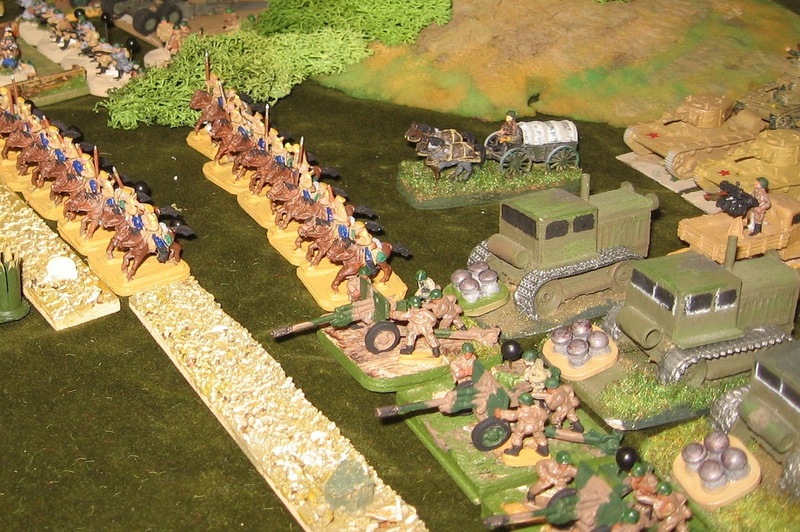 Surely the Soviets will run out of manpower and artillery soon?